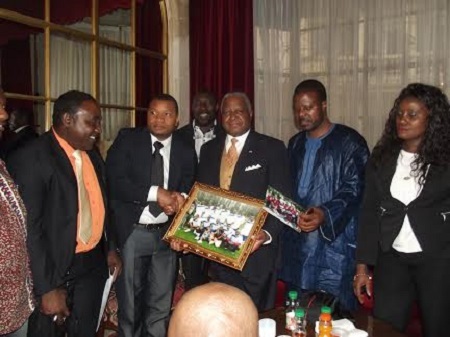 Outgoing Liberian ambassador to France D. Mckinley Thomas has called on members of the Liberian community in the European country to work together as a team. Addressing the community recently, the ambassador urged them to put aside their differences and unite in one accord. He added that it is through unity and cohesion that they will be able to achieve their aims and objectives and thus contribute to the rebuilding of Liberia. He made the remarks recently when members of the community living in Paris, the French capital, and other outlying provinces came to say good bye to him, according to a release issued by Isaac C. Yeah, Press and Public Affairs Counselor at the Liberian embassy in France. Ambassador Thomas, who was also accredited to Switzerland, Greece, Spain, Portugal and UNESCO, is expected to leave France soon to take up a new assignment as Liberia’s Ambassador Extraordinary and Plenipotiary in Beijing, China. Differences, he said, will always exist where there are many people. He however challenged them never to allow their differences in ideas and opinions to separate them from one another or deter them from seeing the bigger picture in their efforts to achieve their common goals. “We are all Liberians, we may disagree, but let not our disagreements lead to division. We must at all times enhance our productivity and set a steady course that realises our objectives,” he noted. Amb. Thomas called on the various Liberian groups in France to forge a single agenda and follow the democratic process in the election of their various leaders to represent the interest of all, adding that in unity there is strength. Earlier, the interim chairman of the community Mohammed Kanneh said members of the community see it an obligation to extend a hand of good bye to the outgoing ambassador for his contributions to Liberians living in France. Mr. Kanneh praised Amb. Thomas for having a cordial working relationship with Liberian community members and also for seeking their interest in times of need. He said Amb. Thomas has had open arms in addressing the problems and concerns of the community. The community’s secretary general Fasu B. Kamara, in a statement, recounted the level of cordiality and friendship and recalled Ambassador Thomas’ many achievements and wished him well in his new assignment. Ambassador Thomas formerly served as commercial counselor in the Liberian Embassy in Belgium before being appointed as ambassador to France in 2005 by former Chairman Gyude Bryant to France in 2005. He was re-assigned by President Ellen Johnson-Sirleaf in 2006. Former Director General of the Civil Service Agency Dr. William Allen is to take over as Liberia’s new Ambassador to France shortly. Dr. Allen also served as Minister of Information, Culture and Tourism in the Transitional Government of Chairman Gyude Bryant.